“Innovation” was the theme of this year’s Annual Meeting of the United Methodist Foundation of Louisiana, held April 22 at the Country Club of Louisiana in Baton Rouge. The meeting was a celebration and review of the Foundation’s latest innovative programs to develop leadership for effective ministry among clergy and laity. Rob Fairly, president of the Foundation, and Chairman of the Board Irwin Felps led the meeting. Special guests included donors, Louisiana Annual Conference staff and several past Foundation Board chairs. Rev. Joseph Awotwi of Alexandria was elected Chairman of the Board of Trustees and L. Nettles Brown of Natchitoches was elected Vice Chair. Omer Davis of Baton Rouge was elected to serve as a member of the Board. Also elected were Rev. 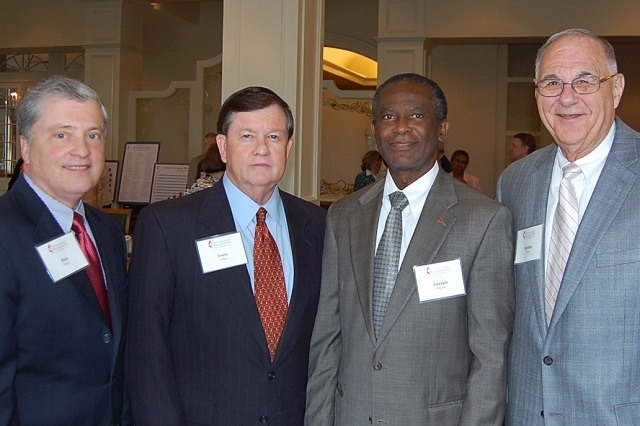 Weldon Bares, Lake Charles, Grants Committee Chairman; Mike Dehart, Lafayette, Investment Committee Chairman; and James Goins, Shreveport, Loan Committee Chairman. Others continuing their terms as board members include Mae Belton, Baton Rouge; Frank Harrison, Lafayette; Rev. Michi Head, Baton Rouge; Sandra Kuykendall, Secretary, Baton Rouge; Richard Lewis, Ruston; Bill Potter, Baton Rouge; Alice Prophit, West Monroe; Rev. Larry Stafford, Monroe; and Rev. Fred Wideman, Baton Rouge. Irwin Felps, Baton Rouge, was recognized as outgoing Chairman of the Board for his two years of outstanding service. Pictured at the meeting are Rob Fairly, Irwin Felps, Rev. Joseph Awotwi and L. Nettles Brown.